Russian earth weather satellite. 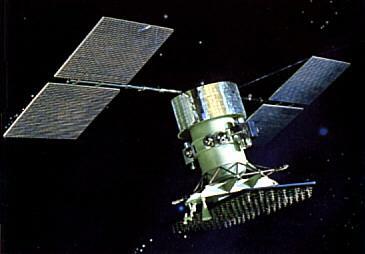 Elektro was to be the geostationary component of a third generation Soviet meteorological system. Following extended development, it flew only once, in 1994. Meteorology satellite built by NPP VNIIEM, Russia. Launched 1994. AKA: 11F652;GOMS. Status: Operational 1994. First Launch: 1994-10-31. Last Launch: 1994-10-31. Number: 1 . Gross mass: 2,580 kg (5,680 lb). The troubled spacecraft could not be put into use, and the whole project was finally cancelled. On 16 December 1972 the VPK Military-Industrial Commission ordered development of a third generation meteorological system. This used the Planeta-S sensor package in the non-co-orbital Meteor-3 system plus the geostationary system Elektro, which was to begin tests in 1982. The draft project for the Planeta-S was completed in 1979, followed by detailed design in May 1980. A 1981 resolution called for a Planeta unified meteorological system. This was developed at VNIIEM MEP by N N Sheremtyevskiy and Yu V Trifonov. Development of the Elektro component ran into enormous obstacles in the period 1983-1987, with a mock-up not begin completed until 1989. Only then were drawings for a flight article completed. Elektro's numerous delays were due to both equipment and software problems, and the project went through two heads of development (Andronik Iosifiyan and Vladimir Adasko). There was finally only a single launch of Elektro, in 1994. The troubled spacecraft could not be put into use. The whole project was finally cancelled, the official reason being the incompetent head of development at VNIIEM. to call for the data collection platforms` to transmit the information to the satellite. The GOMS network was to consist of three spacecraft spaced 90 degrees apart in the geostationary ring: at 14 degrees W, 76 degrees E, and 166 degrees E. Each 2.6-metric-ton spacecraft would have a payload capacity of 650-900 kg with an estimated operational lifetime of at least three years. The satellite was 3-axis-stabilised and received a maximum of 1.5 kW (900 W for the payload) produced by two rectangular solar arrays. Twelve communications channels linked the spacecraft to the receiving and processing centers, the independent data receiving center, and the data collection platforms. The main data receiving and processing center was in the Moscow region while two regional centers were located at Tashkent and Khabarovsk. The Elektro satellite equipment suite for the first mission did not include the planned 6 to 7 micrometer scanning radiometer. The telephotometer was limited to a total of 24 frames per day (each framing session lasts 30 minutes of which 15-20 minutes was imaging time), and only 4-5 frames could be successively taken at the 30 minute per-frame imaging rate. This high frame rate would normally were employed around 0000 and 1200 GMT, in part, to permit the calculation of wind speed and direction data. DCP information was to be collected and transmitted at three-hour intervals each day, i.e., 0300 GMT, 0600 GMT, etc. Family: Earth, Earth weathersat, Geosynchronous orbit. Country: Russia. Launch Vehicles: Proton, Proton-K/DM-2. Launch Sites: Baikonur, Baikonur LC81/23. Agency: MOM, VNIIEM. Bibliography: 102, 119, 2, 274, 445, 6, 67, 6474, 12313. 1972 December 16 - . Elektro, Meteor-3 weather satellites authorised - . Nation: Russia. Spacecraft: Elektro, Meteor-3. Military-Industrial Commission (VPK) Decree 'On establishment of the Planeta-S weather satellite system' was issued. The resolution ordered development of a third generation system. This used the Planeta-S sensor package in the non-co-orbital Meteor-3 system plus the geostationary system Elektro, which was to begin tests in 1982. Elektro suffered numerous delays due to equipment and software problems. Flight trials of Meteor-3 did not begin until 1984, and there was only a single launch of Elektro, in 1994. 1994 October 31 - . 14:30 GMT - . Launch Site: Baikonur. Launch Complex: Baikonur LC81/23. LV Family: Proton. Launch Vehicle: Proton-K/DM-2. Elektro 1 - . Payload: Elektro s/n 1L. Mass: 2,850 kg (6,280 lb). Nation: Russia. Agency: MOM. Class: Earth. Type: Weather satellite. Spacecraft: Elektro . Completed Operations Date: 1998-09-01 . USAF Sat Cat: 23327 . COSPAR: 1994-069A. Apogee: 35,799 km (22,244 mi). Perigee: 35,782 km (22,233 mi). Inclination: 4.70 deg. Period: 1,436.30 min. Stationed at 76.61 deg E. Elektro 1 was finally launched on 31 October 1994, 15 years after its original public schedule. Malfunction of the local vertical sensor and the attitude control system delayed the positioning of the spacecraft at its intended location of 76 degrees E, but by early December Elektro 1 was on station. However problems with the local vertical sensor continued to plague the spacecraft, and useful images were not available. Stayed in geosynchronous orbit at 76 deg E in 1995-1998 before being shut down. As of 4 September 2001 located at 71.89 deg E drifting at 0.069 deg E per day. As of 2007 Mar 10 located at 67.89E drifting at 0.000W degrees per day. 2015 December 11 - . 13:45 GMT - . Launch Site: Baikonur. Launch Complex: Baikonur LC45/1. LV Family: Zenit. Launch Vehicle: Zenit-3SLBF. Elektro-L No. 2 - . Nation: Russia. Class: Earth. Type: Weather satellite. Spacecraft: Elektro. USAF Sat Cat: 41105 . COSPAR: 2015-074A. Apogee: 35,792 km (22,240 mi). Perigee: 35,781 km (22,233 mi). Inclination: 0.0800 deg. Period: 1,436.09 min. Russia launched a Ukrainian-built Zenit-2SB vehicle with an NPO Lavochkin 'Fregat-SB' upper stage carrying the Elektro-L No. 2 weather satellite to GEO. The Zenit-2SB second stage reached a 164 x 539 km x 51.4 deg parking orbit at 1352 UTC. The Elektro-L/Fregat-SB separated; after a first Fregat burn to 271 x 4277 km at 1500 UTC, the SBB drop tank was jettisoned. A second burn at 1711 UTC put the vehicle in geotransfer orbit, and a third burn at 2232 UTC circularized the orbit at apogee. Fregat separated and later made a fourth burn to graveyard orbit, leaving Elektro-L in the geosynchronous region.